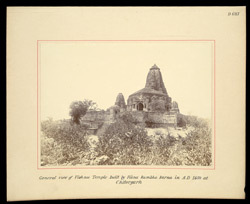 Photograph of the Kumbha Shyama Temple at Chitorgarh in Rajasthan, taken by an unknown photographer for the Archaeological Survey of India Collections: Northern Circle (North-Western Provinces and Oudh) in 1896-97. The hill-top fortress of Chitor was ruled by the Guhilot (later Sisodia) Rajputs from the 8th to the 16th centuries. The buildings that survive today are mainly from the reign of Rana Kumbha (1433-1468) as the fort was invaded several times and earlier structures were destroyed. In 1567, the fort was sacked for the final time by the Mughal Emperor Akbar and Rana Udai Singh II abandoned Chitor for Udaipur, chosen as the new capital of the Mewar state. The Kumbha Shyama Temple is dedicated to Vishnu and is situated in the same complex as the Mira Bai Temple. It was originally built in the eighth century and was enlarged by Rana Kumbha in the 15th century. It is dedicated to Vishnu and the wall niches display images of Hindu deities. The pyramidal roof and tower of the temple can be seen in this photograph.